Here are three planks of wood that will become spectacular tops for individual benches! It’s rare that I will order woods – I’ve been taken advantage of too many times with promises that were imaginary great boards in the sellers minds. I will now ONLY order from two suppliers. One is Bell Forest in Michigan and the other is Cook Woods in Oregon. These three came from Cook Woods and I’m thrilled! I’m always on the lookout for really spectacular specimens of great woods that would work well with the types of benches I normally produce. When my shoulder permits and the Doc allows my first effort will be a large run of benches. 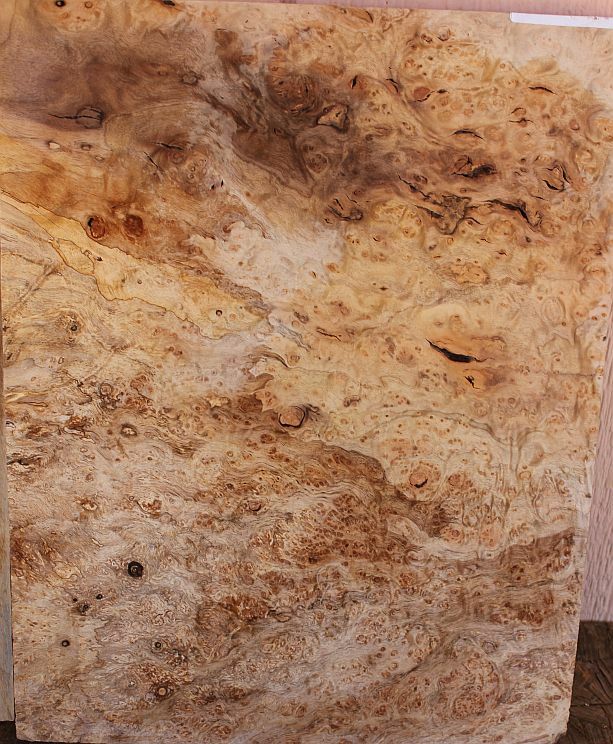 This is a truly remarkable example of Myrtle Burl. It’s about 20 x 15 and has the most special figure. The burl swirls will just pop when I apply whatever finish I use. It’s gonna be somewhat larger than normal but I just don’t have the heart to cut this beauty. As I do during bench runs, I first gather woods for tops, then legs, skirts, and stretchers. The real fun comes in matching the combinations together and really, I’m always surprised at what comes about. 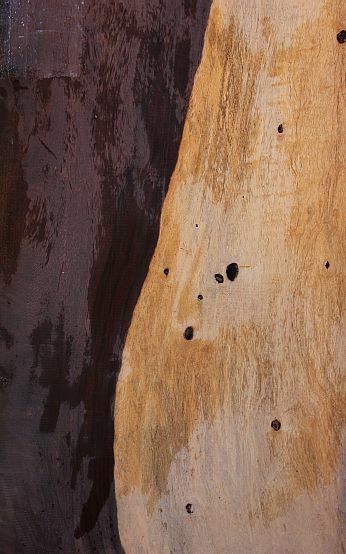 I sometimes then look for specific woods for either the skirts or legs to specially match really unusual tops. On this bench, I’m sure to not cut a hand hole – who would do that to such a pretty board? This board is a very rare example of Katalox – with lots of sapwood and a few remnant evidence of worms feeding on the fibers. 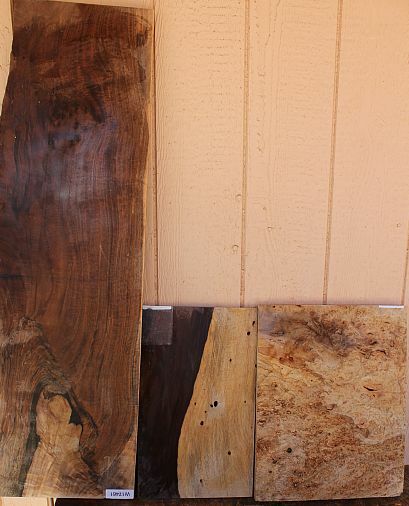 I look for boards that have character – especially sapwood and bark inclusions. This one will yield a spectacular bench! Now, the very special one. 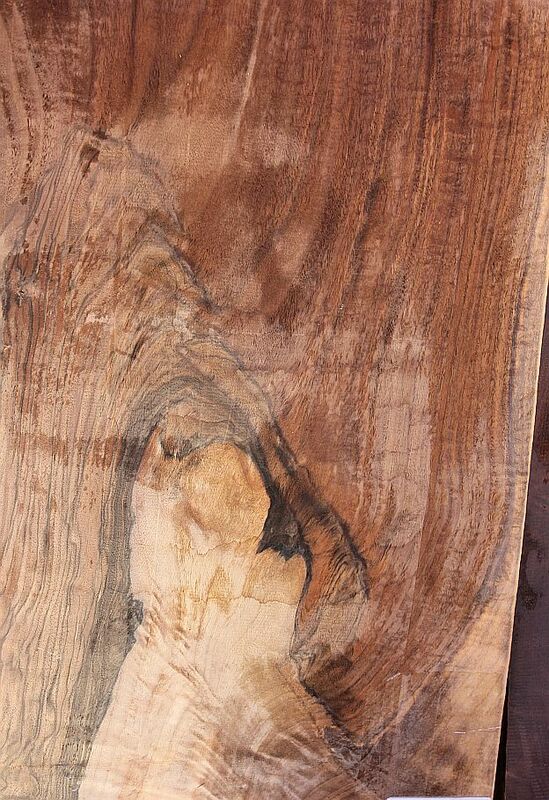 It’s already been chosen as the wood for the top of a bench by a special customer. I had purchased the board intending to make two benches, but the customer wanted a long bench at custom dimensions, so here was what set her choice. It’s 14 x 39 and I’ll make the top to 14 x 34 and the bench 17 tall. The wood is a very special crotch board from a Claro Walnut tree, with an exceptionally unusual feature at the crotch where white sapwood grew solid to the center! I’m actually stunned by this example and really do look forward to making this bench first in my bench run. The figure will just explode with application of a finish – and I’ll surely post a photo of the finished piece. I’ve already picked the woods for the rest of the bench, and you’ll see what they are later. My recovery continues well, though painfully slow. My patience is solid – I’m determined to do this well. My goodness, how I’d hate to go thru this again…… I yearn to saddle up on “The Old Buzzard” and ride away for a long ride, but that’s still weeks out. There is much more comfortable movement of the shoulder, yet I’m keeping deliberate and cautious. Thanks to so many people who’ve been offering encouragement, support, and even assistance during this time. I really do appreciate every comment. Cat is the most astounding nurse on the face of the earth!